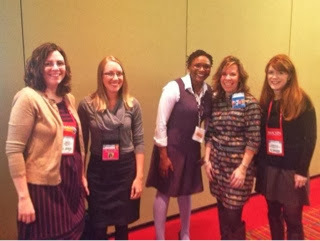 AASL 2013 was hands down the most amazing conference experience I have ever had. I knew it would be epic: 2500 School Librarians all in one place? Mind boggling. The experience definitely warrants several blog posts, but I'm beginning with our presentation on genrefication. 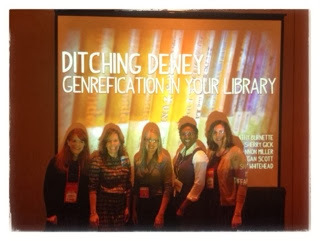 I had the privilege of presenting with 4 friends on the topic of genrefying our libraries. 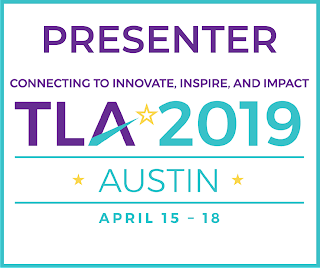 Kathy Burnette, Megan Scott, and I had made a similar presentation in October at our state ILF conference, but joining forces with Tiffany Whitehead and Shannon Miller brought it to epic proportions. 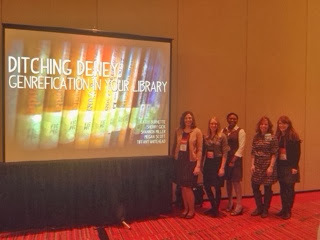 Each of us shared about the process of genrefying our libraries: the why, the how, and the incredible effects on our circulation and students. We ended with this video from our students' perspectives because really, isn't it all about them? Ditching Dewey from Tiffany Whitehead on Vimeo. SLJ even wrote an article about our presentation! 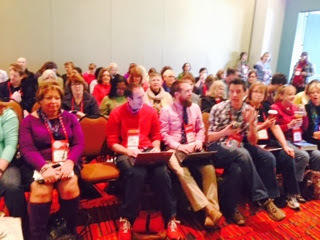 (*faints*) and the hot topic of Genrefication at the UnCon -- blog post coming soon! I think we certainly got people thinking and talking about our student-centered approach to school libraries which to me equals success. As someone who has made the switch from Dewey this year, I really wish I could have seen this presentation. So many doubters out there but every article I've read about libraries switching have been overwhelmingly positive. I have yet to read about a library who has switched and had it fail. Keep up the good fight! Thanks Casey! If you're a member of ALA, the audio/powerpoint is available on eCollab from our presentation! Way to go making the switch -- being student centered is what it's all about!